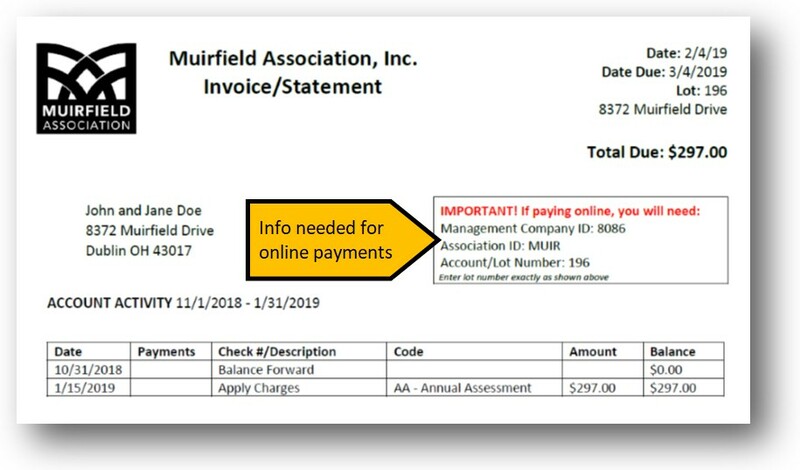 Muirfield Association annual assessment invoices have been sent and payment is due by Wednesday, March 6, 2019. There are more payment methods available than ever, including the ability to pay online by eCheck, debit or credit! There is a lot of information here, so email us or call 614-889-0922 with questions. Muirfield Association is pleased to announce a partnership with Alliance Association Bank (AAB). Alliance Association Bank was chosen because they have developed a national banking program that works exclusively with common interest communities and is designed to meet the needs of HOAs. AAB offers safe, secure methods of payment, including the ability to pay online by eCheck, debit or credit card. In addition, they have extended support hours to assist with making payments on their site. Account Number: Your lot number (different for everyone). Enter it exactly as shown. It is critical to include this information to ensure proper posting to your account. This information can be found in the box to the right of your name and address on your invoice. See image below. Residents on paper communications should look for a regular business-size white envelope as early as February 1. The envelope will include your invoice and a return envelope. Contact the office if you have not received your invoice by February 8. Residents on electronic communications will receive an email that looks very different from ones sent in previous years. This email may initially look like spam to you. The email will come from "Muirfield Association Management, LLC" and the title will be "Your Account Statement is Ready". See image below for an example of the email. Click the blue "DOWNLOAD STATEMENT" button in that email to view your invoice. Viewing your invoice or downloading it will require that a PDF reader (such as Adobe Acrobat, which is free) is installed on your computer. Check your spam and deleted items if your email does not appear in your inbox and contact the office if you have not received the email by February 8. The annual assessment rate is $2.20 per $1,000 of the fair market value of the property as determined on or about January 1 of each year by the County Auditor. In light of the fact that so many property values went up, the board of directors decreased the amount of the assessment from $2.25 per $1,000 to the new $2.20 per $1,000 as of last year's billing. The assessment is billed one year in arrears, similar to property taxes. The assessment being billed in 2019 is for the year 2018. To calculate the annual assessment amount, take the fair market value as placed on the property by the county auditor and multiply it times .0022 to get the annual assessment. For example, if the fair market value of a property as of January 1 is $300,000, the invoice for the prior year (January 1 through December 31) will be $660.00. If you have an overpayment or underpayment from the previous year, this amount should reflect on your invoice. Please call the office if you have questions. Keep reading or click the links below to learn more about each payment method available. Payment is due by Wednesday, March 6, 2019. Access the AAB online portal here. For those on paper communications: detach the bottom stub of the statement you received in the mail, enclose it with payment in the envelope provided, and mail to the address shown on the stub. The stub contains information that is imperative to properly credit your account, so be certain to include it. For those on electronic communications: You will receive an email with a link to your statement. Print it and mail it along with payment to the address above. It is very important to send the stub or statement so AAB staff can properly credit your account. You must include your lot number to ensure proper posting to your account. Without your lot number, the bank will not know where to post your payment. Enter it exactly as shown on your statement. 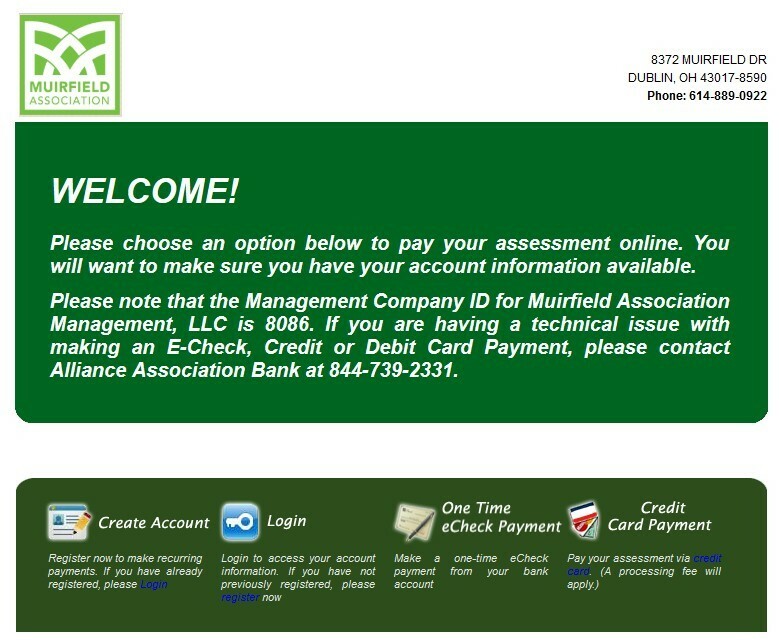 *Neither Muirfield Association nor AAB charge fees to pay using your bank’s bill pay program. Most banks do not charge a fee to pay bills online, but check with your financial institution if you are unsure. There is no fee to pay by eCheck. Before beginning, you must have the Management Company ID (8086), Association ID (MUIR) and your lot number, which is on your statement. You must also have your checking account information: (1) Routing number and (2) Account number. Do not include the check number as part of the account number. See image below. Go to the AAB Portal to Pay by eCheck. Click on “One time eCheck Payment” and enter the information requested. Optionally, you may create an account to save your information for future payments. Read more about accounts. If you do not create an account, be certain to provide a good email address in order to receive a receipt. The office is open Monday – Friday from 8:00 to 4:30 p.m. (excluding federal holidays, such as Presidents Day) and is able to accept cash, checks and money orders. The office cannot process eCheck, debit or credit card payments over the phone or in person; these must be made online by the resident. There is a locked drop box outside the front door for your convenience, but do not leave cash in the box! If paying by debit card, a $5.00 (five) dollar convenience fee will be added to your total. This fee is charged by AAB. Muirfield does not receive this fee. Before beginning, you must have the Management Company ID (8086), Association ID (MUIR) and your lot number, which is printed on your statement. To make a payment by debit card, you must make it on the Alliance Association Bank website. Debit card payments can't be processed by Association staff. Go to the AAB Portal to Pay by Debit Card. Click on “Credit Card Payment”. Enter your debit card information and any billing information requested. Be certain to include a valid email to receive a receipt. Important! If paying by credit card, an additional 3% of the amount you are paying will be added to your total. This fee is charged by the credit card company for their processing costs. Neither AAB nor Muirfield receives this fee nor do they profit in any way from it. Before beginning, you must have the Management Company ID (8086), Association ID (MUIR) and your lot number. To make a payment by credit card, you must make it on the Alliance Association Bank website. Credit card payments can't be processed by Association staff. Go to the AAB Portal to Pay by Credit Card. Click on "Credit Card Payment" and read the fee notice. Enter your credit card information and any billing information requested. Be certain to include a valid email to receive a receipt. Credit card payments may take up to five business days to process. Payment is due in full by Wednesday, March 6, 2019. Pay by that time to avoid having a late fee assessed (8% interest annually). Credit card transactions may take up to five business days to process, but we will count the date you made the transaction as your paid date. It is not necessary to set up an account to pay using AAB. However, creating an account is useful if you plan to pay in the future by eCheck. The account will save your checking account information and payment history. Accounts do not save credit or debit card information, nor do they reflect any payments made by paper check or through your bank's bill pay program. Go to the AAB portal to create an account, then click “Create Account” and enter the information requested on the screens that follow. Be aware that answers to secret questions are case sensitive; e.g. “Cleveland” is not the same as “cleveland" or “CLEVELAND”. Keep this is mind when creating your answers. Check your email for a confirmation of the creation of the account, then log in and choose a payment option, but keep in mind that the account only saves checking account information and not credit or debit. Please note that Muirfield staff does not have access to your information on the AAB site, so they can’t assist with online payments or technical issues. Please call AAB at the support number above. However, Muirfield staff can answer questions regarding individual charges appearing on your invoice. Need More Information? If you have questions or concerns about anything in this email, need to confirm or update your mailing address, email address or communication preferences, haven't received your invoice by February 8, have misplaced your invoice and/or need your lot number or amount due, please call the office at 614-889-0922 or email [email protected]. We are here to help!